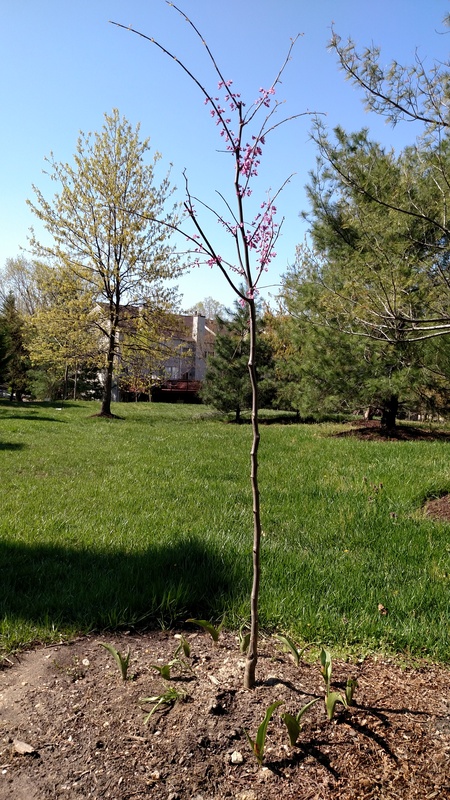 Last year, my husband planted this Eastern Redbud tree in our backyard to celebrate my birthday. This is our first Spring to watch it bloom. Redbud trees have small rosy-pink flowers that outline its bare branches like strings of lights. The flowers follow the curve of the tree limbs giving these trees a light and airy quality. They add an elegant and subtle beauty among the bigger “cotton candy” shaped Spring blooming trees. The Eastern Redbud are native to Eastern United States and Canada. They can be found tucked among larger trees in neighborhoods, along roadways and in the woods. One day my son and I played “look for the Redbud trees” while driving home from school. Planting a tree is fun and opens our eyes to nature around us.